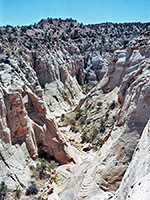 Five Mile Wash is one of the many canyons that drain the east side of the Waterpocket Fold in Capitol Reef National Park, part of a group of seven that have recognized hiking routes along at least part of the way, the others being Capitol Gorge, Pleasant Creek, Burro Wash, Cottonwood Wash, Sheets Gulch and Oak Creek. From the edge of the reef, Five Mile Wash deepens and narrows steadily, but a deep pool and an unclimbable dryfall quite early on stop easy progress up the canyon, which instead can be followed high above at rim level; a hike which affords quite spectacular views over the surrounding domed summits, the eastern plateau beneath the Henry Mountains and of the canyon itself, far below and containing many pools and narrow sections. The wash is ten miles south of UT 24 along the Notom-Bullfrog road and is identified by a sign, as are all other major streams that cross this route. 11 views of Five Mile Wash.
TopoQuest topographic map of Five Mile Wash.
From the main road, an old disused track runs close to the north side of the wash for about half a mile then joins the streamway. It does continue for a while on the far side, but the easiest way to proceed is just to walk up the wash from this point on. Judging from the lack of footprints or car tracks, Five Mile Wash is rather less visited than Burro Wash, a few miles north. 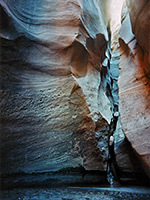 The canyon narrows quite soon as it enters the Carmel Formation sandstone layer, at the edge of the cliffs; it then cuts through many different strata, and has a mixture of shallow, curved channels, small dryfalls, pools and intermediate flat sections, always with much fallen rock in the streamway. 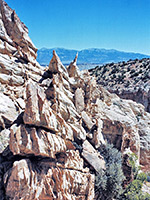 There is one medium sized dryfall that may be bypassed by climbing a slope on the left hand side, then the canyon becomes markedly deeper as it enters the white Navajo sandstone layer that makes up most of the center of the reef. Soon, the canyon walls become near-vertical and close in abruptly, to a passage usually blocked by a pool 3 feet deep (up to 5 feet after recent rains), which is filled with debris, and has a large boulder wedged just above water level. Beyond is a short submerged passage then a deeper pool with a narrow slit beyond that enters several feet above water level. 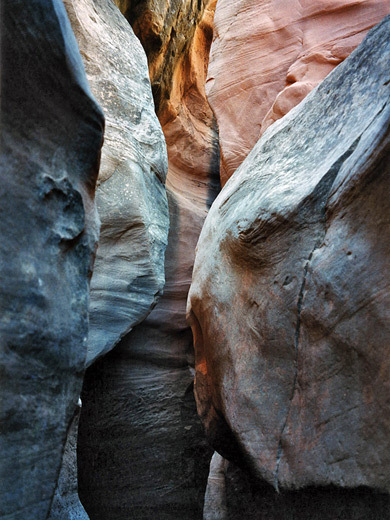 The canyon is now completely enclosed, cold and rather dark, and there is no obvious way to continue - to properly explore the narrows requires starting from a trailhead on the west side of the reef, and descending via a mixture of hiking, wading and rappelling. 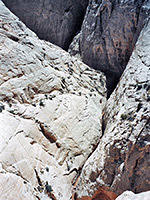 A walk along the top of the cliffs is one way to see more of the canyon; after retreating about 200 yards and climbing up the rocks on the north side, it is fairly easy to follow the wash upstream, which becomes very deep and has long muddy pools, large boulders and lengthy enclosed sections. There are no obvious climb down routes for several miles, so no easy way to re-enter the narrows. Instead the canyon remains very deep and winds into the distance beneath huge white cliffs, affording great views of remote landscape on a grand scale.